A few days since we called upon Rev. John Kelley, just below Union Landing, for a talk, knowing that he was one of the early settlers of Lawrence County, and in our rambling conversation drew out some facts that may not be without interest to our readers, and some of which are worthy of record. We will premise that Mr. Kelley is now in his 75th year, is hale and hearty for a man of his years, and seems to have a vivid and accurate recollection of past events. The founders of the Kelley family of Lawrence County were Luke Kelley and Mary, his wife, the parents of Rev. John Kelley, who will be recollected by some of the older of our readers, and who died about thirty years since. Luke Kelley was born in Shenandoah Co., Va., in what is now Page County, of Irish parents; Mary Keyser, his wife, was born in the same county, of German parents. Luke Kelley and Mary Keyser were both left orphans while quite young, were married at an early age, and started in life quite poor--with nothing except their integrity, industry and energy. After marriage they lived for a year or two in their native county, where Rev. 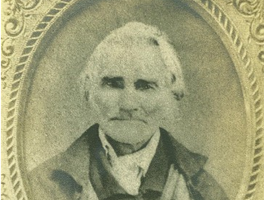 John Kelley, their first child was born on June 3, 1780, but while he was still at the breast, the parents removed into Bath County, a few miles distant from the Warm Springs, where they remained nine years. In 1790, when John was ten years of age, they removed into Russell County, in South-western Virginia, into a frontier settlement on Clinch River, where they lived for several years, during Indian wars, and subsequently removed once more to the place below Hanging Rock, where they died. The family of Luke and Mary Kelley consisted of John, before spoken of as their first child; Elizabeth, deceased, the wife of Judge Nathaniel Davisson; Joseph Kelley, deceased, father of William D. Kelley and brothers and sisters, of Ironton; Charles Kelley, now living at Kelley's Mills, whose sons are Wm. H. Kelley, of Union Landing, and Isaiah W. Kelley, of Ironton; Joshua Kelley, now living near Union Landing, the father of Rev. James M. Kelley, of Ironton; Mary, who married Vincent Powell, of Greenup County, Ky., and is now living in Tennessee, married the second time to Henry Hayes; and Reuben Kelley, now living at Plattsburg, Mo. Rev. John Kelley married Abigail Lambert, daughter of Josiah Lambert, one of the early settlers of the County. She has been dead some ten years. Their children were Mary, married to Thomas Dollarhide, soon left a widow, and now living with her son-in- law, in Indiana; Whitefield Kelley, Esq. ; Darby, deceased two or three years since; Elizabeth, wife of Joseph Andre, near Powellsville; and Anna, wife of George Collins, with whom Mr. Kelley now resides, at his old homestead. And also read another article from Lawrence County (click below).